Functional and stereotactic surgeries were first introduced in 1940’s and 50’s, but did not make progress as expected due to high mortality and morbidity rates. Neurosurgery developed in India after the II world war. In 1940 pioneers like Chintan Nambiar performed 74 cases of chemopallidotomy using free hand stereotactic technique. In 1949 Jacob Chandy and Baldev Singh established the first neurosurgical centre at Christian Medical College (CMC), Vellore in Tamilnadu. In 1950’s V. Balasubramaniam and B. Ramamurthi performed pallidal lesioning with inflatable balloon and alcohol. H M Dastur started stereotactic surgery at King Edward Memorial (KEM) Hospital Mumbai in 1959. Initially he used Oliver’s guide and later used Narabayashi frame along with Dr. Gajendra Sinh (Jaslok hospital, Mumbai) to perform stereotactic surgery. Dr S N Bhagwati (Mumbai) used Mckinneys apparatus and Leksell’s frame in 1964. In 1970, S. Kalyanaraman (Madras Medical College) performed stereotactic surgeries using a combination of Leksell and Sehgal stereotactic equipment to perform simultaneous targeting of intracranial structures. R M Verma who was trained in Bristol started neurosurgical units in AIIMS and was instrumental in establishing National Institute of Mental Health and Neurosciences (NIMHANS). The Indian Society of Stereotactic and Functional Neurosurgery was formed in 1997 with V. Balasubramaniam, as its first President. 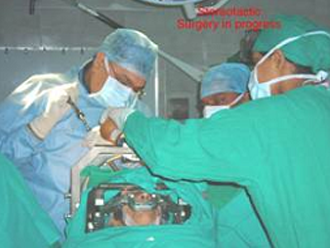 Stereotactic Radiosurgery was first introduced in India at the Apollo Hospital, Chennai using Linac X-knife system. Gamma knife was introduced at Hinduja Hospital, Mumbai in 1997. In Mumbai Dr. Paresh Doshi (Jaslok Hospital, Mumbai) performed surgery for Parkinson’s disease. Initially he started with GPi lesioning and later switched to STN-DBS surgery. In 2009 he was instrumental in performing neural transplant surgery using Mesenchymal Stem cell therapy in collaboration with Reliance Life sciences for Parkinson’s disease. The results of which are awaited.